For cover in impoundments that have limited weed growth, bass use wood cover like stumps, timber, brush piles and laydowns. Highland and canyon impoundments are known more for woody growth and rocky structure than for expansive weed beds. If they do have weed growth it is found upstream where the deposits of sand and silt create a bottom conducive to the growth of vegetation. 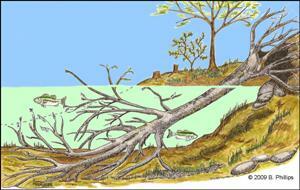 Stumps, standing timber, fallen trees and brush piles are the premier bass "cover" in reservoirs. Stump fields, left over after initial clear cutting prior to flooding, are great habitat for bass, especially largemouth. Standing, flooded timber also draws suspending bass that are hunting baitfish in deeper water. Laydowns, which are fallen tress or old logs, are bass attractors as well, especially in spring. Look for one that is alone, apart from any other significant cover. Brushpiles are always holders of fish, including bass. But fishing them "properly" is the key to pulling bass or any other fish out of the tangle. Stumps are wood cover greatly favored by bass. Now it's tough to beat grass as bass habitat. But it isn't found in every lake and fishing it can be aggravating beyond the limits of a man's patience. Being constantly hung up, missing strikes and retrieving what feels like an entire field of turnip greens can drive a man to drink. Enter the wonderful stump, wood cover supreme. Bass tend to use them for cover most of the year. They're found in both shallow and deep water. Stumps have a permanence other forms of cover do not as their network of roots keep them in place as a stationary, dependable cover for bass. They tend to endure for long periods of time as they are not subject to rotting away as rapidly as is other wood cover. As their roots become exposed through bottom erosion they provide great places for bass to hide for safety or from which to ambush prey. Baitfish that are attracted by algae and micro creatures living on and in the wood. Additionally, they're a great source of shade for bass. For the bass fisherman they're not nearly the aggravation to fish that grass can be. Seek out stumps that are on points or near drop-offs. Once you find them carefully approach keeping your distance as bass on stumps seem to spook easily. Cast several feet past the stump then retrieve your lure, preferably a crankbait or spinnerbait, up to and past it. Repeat this on the other side of the stump. Target the shady side first as odds are that's where bass will be holding. These lures illicit reaction strikes and will "call in" bass who might be hanging "around" the stump but not tight to it. Don't cast to a promising stump only once or twice. Work it over with numerous casts before moving on. Many professional anglers like Rick Clunn subscribe to "bumping the stump" with lipped crankbaits. Many strikes occur when the lure deflects off the stump. I "bump the stump" with spinnerbaits too. Give it a try. It works. A 1/4 to 1/2 ounce jig with a pork or plastic craw trailer is also a good stump bait. I'll toss this around the stump's base after having worked it over with other baits. Of course , Teaxs rigged plastic worms are always good to throw. I've even used "shaky worms" with success around stumps. Jigs are not reaction baits remember so the bass must be holding tight to the stump for this technique to be successful. In many reservoirs timber remains standing after flooding, having been spared clear cutting. The trees die of course and they become very beneficial, through their decomposition, in the development of aquatic organisms such as plankton. In turn. this attracts baitfish which live and reproduce in the tree's branches and around its base. Of course bass, whether initially present in the dammed water system or introduced by stocking, also thrive in this newly created underwater Shangrila. For many years this condition remains providing great wood cover and creating fantastic fishing. 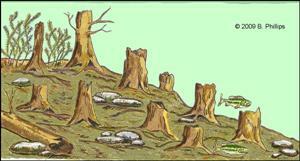 Unfortunately, the trees decompose and over a period of years and the habitat, once wonderful, is gradually degraded. Standing timber that has retained its branches below the surface is a great bass attractor. Once the limbs are gone, however, a tree loses much of its appeal to bass so those trees that retain a crown of limbs should be targeted. Don't forget that "structure" plus "cover" equals potentially great bass fishing. As you scan an area with standing timber look for spots where some tree tops are higher above the water than those around them. Why? Because this means there is a depth change below. Wood cover (standing timber) on structure (hump), now that's better than a cold beer and a can of Vienna sausages. Identify any "lanes" running through the timber. These could well be road beds, boat lanes or creek channels. What you have here then are changes in depth, cover and edges. The thought just makes me drool. If you enjoy fishing spinnerbaits find some standing timber where you can benefit from their resistance to "hanging up". Use a 1/4 to 1-ounce spinnerbait. Traditional thinking is to fish spinnerbaits when the water is off-color or murky because they are reaction lures and you don't want the fish to get to good a look at them. I don't disagree, but I've seen many guys catch bass on spinnerbaits on clear days in clear water. A prime example is Kevin Van Dam. Ever heard of that guy? In early spring, before spawn, when the water temperature moves into the 50°'s, travel into creek arms and shallow (less than 15´) coves that have some timber in them and bring out the spinnerbaits. Jigs with big trailers are good for any wood cover but especially for timber, but don't drop them deeper than the crown of limbs or you'll most likely be below the bass. Flip them to the trunk and allow a controlled vertical drop while carefully watching your line. If the tree has limbs up and down its full length then allow the jig to travel to the bottom before gradually jigging it (lifting it quickly with the rod tip and letting it drop back down a foot or so) to the surface. As wood cover goes, fallen trees are indeed premium bass cover in older impoundments, for many of these lakes will have little or no vegetative cover. These bass holding beauties end up in the water from storms and shore erosion. In some parts of the country beavers do the deed and drop them in. No matter how they get there they are very good places for bass to hang out. Many laydowns enter the water at an angle with the roots end remaining out of or just in water. The trunk and branches are pointing into the water away from shore. Bass use the branches as ambush points and use the space between the trunk and bottom as a hideout and resting place. If the bottom composition is right they'll even spawn under or around the trunk. There are two schools of thought on how to fish a laydown. If it has limbs, in other words not just a limbless log jammed up against the shore, one approach is to position you boat at the tip of the tree and cast in to its root base and then retrieve your lure in the same direction the limbs point. Believe it or not, short billed shallow running crankbaits are very good for this. Yea, I know, all those treble hooks. But if you will keep you rod tip at a high angle during your retirve you are less likely to encounter hang ups even though you're probably bumping branches. Spinnerbaits and their natural weedless construction are also a good choice for fishing laydowns. Fan cast a good laydown with a spinnerbait. Slow roll it through the limbs. Stop when it hits a limb and allow it to drop a few feet. A strike will often occur on the fall. Another approach is to drop a jig or Texas rigged soft plastic at the trunk and retrieve it at 90° to the trunk across the limbs. Casting a shallow running crankbait "across" the limbs can also be productive. While this is more likely to hang up it also covers a lot of area where bass may be holding. I've done all three with equal amounts of success and hang ups. Most likely my problem is "operator error", not a failing with either technique. Because you spell brushpile, "H-A-N-G U-P", they scare the bejezzus out of most of us. But this type of wood cover ia a bass gold mine and should be thoroughly fished when found no matter what the season. Prespawn is the apex time for brush fishing however, when females start their move toward spawn and use brushpiles along the way as rest areas. From these piles they will occasionally venture into and out of shallow water exploring spawning sites. Fishing a brushpile is similar to fishing a laydown. They should be attacked from all sides using soft plastics and jigs to dissect the pile. The weight of the soft plastic sinker or the jig will depend upon the depth of the pile. Cast into the pile's center letting your bait sink to its very bottom. If you're not bit on the way down then slowly pull it out and over the branches. Next fish the outside edges (there is that word again) completely around the pile. Fish it from deep to shallow and shallow to deep positions. Bass seem to look for their food to approach the pile from specific directions determined by current, adjacent structure location or other cover close by. By thoroughly fishing the pile you will have a better chance of finding that direction and increasing your bites.